There are a number of reasons why J. D. Mayhew’s artwork attracts so much attention. Excellence and attention to detail may come to mind first, but eventually the viewer will come to realize that it is this artist’s absolute love of his subject matter that translates into the wonderful images he has been producing for many, many years. His understanding, combined with his amazing competence, makes his work compelling and desirable. Top collections around the globe include his work and his limited edition etchings are highly prized and sought after. An experienced commercial artist in the San Francisco Bay Area, J. D. moved to the north coast of California 36 years ago where he became profoundly interested in the plight of the then-threatened Gray and Humpback whales. He began to incorporate whales into his artwork, and then a locally taught etching class introduced J. D. to that medium, which he found to be just right for his interests. He went on to become a master of the form and produce the huge catalog of marine and other etchings that you may now see in the galleries that represent him. 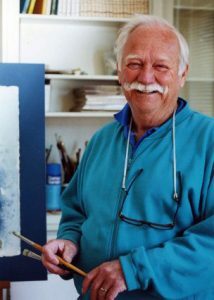 Along the way he helped found the Mendocino Wildlife Gallery which evolved into the Mayhew Wildlife Gallery, where for almost 20 years he showcased and encouraged many emerging wildlife artists and championed numerous environmental causes. He forged strong friendships with other concerned artists and was greatly instrumental in the public recognition of the dangers to whales and the subsequent recovery of these great marine mammals. He was also an outstanding watercolor artist, and managed to produce a large number of works in this medium even while maintaining this output of etchings, no small accomplishment when one considers the total body of work J. D. has created. He was truly and artist who lives and breathed his work, which is why it is so popular, successful and collectible.